A high school degree and structured training program can enable a person to work as an EKG technician in the US. A specialist who provides insight into the efficiency of the heart, an EKG Technician is a crucial member on any healthcare team. She/he uses EKG machine to conduct tests and provide important information for the cardiologist to make further decisions regarding the patient’s course of treatment. The educational eligibility for becoming an EKG Technician is a High School Diploma or equivalent. This is a low entry barrier as most adult Americans have gained this minimum educational qualification. The training required for becoming an EKG Technician can be imparted directly on the job, or in the classroom. 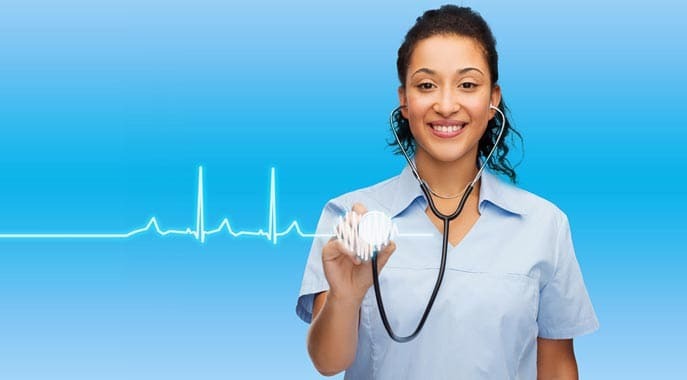 Considering the high demand of EKG Technicians and the existing work pressure on the existing healthcare staff, health care institutions prefer pre-trained EKG Technicians who are able to contribute to the workplace immediately after joining. The classroom training may happen at colleges or vocational training centers. The training covers important electrocardiogram-related theory as well as provides practical exposure through internships in health care centers. Operating Electrocardiogram Equipment: The primary job role of an EKG Technician is to operate the electrocardiogram equipment. This equipment is not highly complicated, but it cannot be operated efficiently without proper training. Apart from operating the equipment, the EKG Technician also learns about maintaining the machine, primary troubleshooting, report generation, and report reading. Cardiovascular Anatomy: The EKG Technician should be well-versed with functioning of the heart and its anatomy in great detail. While she/ he is not required to make decisions or decide the course of treatment, this knowledge makes him more efficient in the course of carrying out her/his duties. EHR: These days, no health care duty is complete without EHR (Electronic Health Records), which is widely used due to the advent of computing technology and software. The electronic records are used by health care facilities for in-house records management, tracking the progress of patients’ treatment, interfacing with insurance companies, complying with health care laws etc. The EKG Technician must have appropriate knowledge of computing and the ability to learn specific requirements of managing EKG-related records. Relevant Laws: The EKG Technician should be aware about the important medical laws and their implications. Such knowledge helps the EKG Technicians make correct choices at the workplace while remaining within the purview of the law. Practical Exposure: The training contains a component of practical exposure through working onsite at a health care institution and assisting the EKG Technician in their daily duties. Certified EKG Technician (CET), awarded by American Certification Agency (ACA) for Healthcare Professionals, National Healthcare Association (NHA) or American Society for Phlebotomy Technicians (ASPT). Certification is not mandatory in most states including CT.
Apart from educational qualification, there are physical and emotional requirements. Patient Handling: While this is not a technical skill, it definitely cannot be overlooked. The EKG Technician requires skills good in the areas of interpersonal communication for calming anxious patients, dealing with patients’ relatives, handling patients during emergency etc. Physical Strength: The electrocardiogram equipment is heavy and might require movement from one place to another. Physical strength as well as good body flexibility is required for carrying out this responsibility. Working under Stress: The EKG Technician may be required to work under varying degrees of physical and/or emotional stress. Physical stress may arise due to long hours, overtime, working in remote locations, working in war zones or areas with strife etc. Emotional stress may arise due to emergency situations, trauma patients, patients with severe cardiac conditions and the possibility of death, dealing with actual death of a patient etc.